Enhance Your Smile With Invisalign® We answer your most asked questions! Perhaps you wished you had gotten braces when you were younger, or you avoided them simply because of how they looked. Fortunately, orthodontics has come a long way and metal traditional braces are not the only way to straighten one’s teeth. At CDC Dental, we use Invisalign because it gets patients excellent results, discreetly and comfortably. 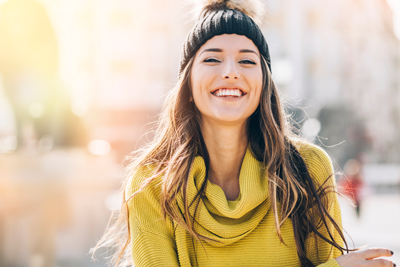 As pioneers in creating clear aligners, Invisalign has invested considerable time and money to make improvements to their already effective system. Now, a significant percentage of the population can wear the aligners and get gorgeous results! Here are some answers to questions we often get about Invisalign. At What Age Can People Start Wearing Invisalign? Children between the ages of 11-13 can be fitted with Invisalign as long as their teeth have completely grown in and have no decay but we treat patients of all ages! We quite often see Sydney brides getting ready for their wedding day – they have been delighted with the results. The aligners are simple to wear and quite comfortable, much more so than traditional braces. After an initial period of getting used to them, you will hardly notice you are wearing them. Can anyone tell that I am wearing Invisalign? Can I Remove My Aligners? Yes, but only for eating and drinking beverages such as coffee, tea or red wine that can stain. It’s important that aligners are worn for approximately 22 hours a day to achieve full benefit. One of the advantages of being able to remove the aligners while eating is that you can eat most foods; that’s not the case with traditional braces. At your first visit, we’ll take impressions and photos of your teeth and send them off to Invisalign so that your treatment plan can be created. We’ll show you the starting position of your teeth as well as the ending position and all stages in between. During your second visit, we’ll review your treatment plan with you and get your approval to ensure you’ll be pleased with the results. Once we obtain your approval, the process of making your aligners begins. You’ll be given 2-3 sets of aligners to take home, and will wear each set for two weeks. We’ll check on you at least every six weeks to assess your progress. Treatment for adults takes about a year, but some patients can see results in 6-9 months. Results vary, depending on the complexity of the case. At the conclusion of treatment, retainers may be recommended, so your teeth will remain straight. Want a stunning, straight smile in Sydney? Contact our practice today to schedule a complimentary consultation!